Take on Winter: Season's Greetings from Wellesley! 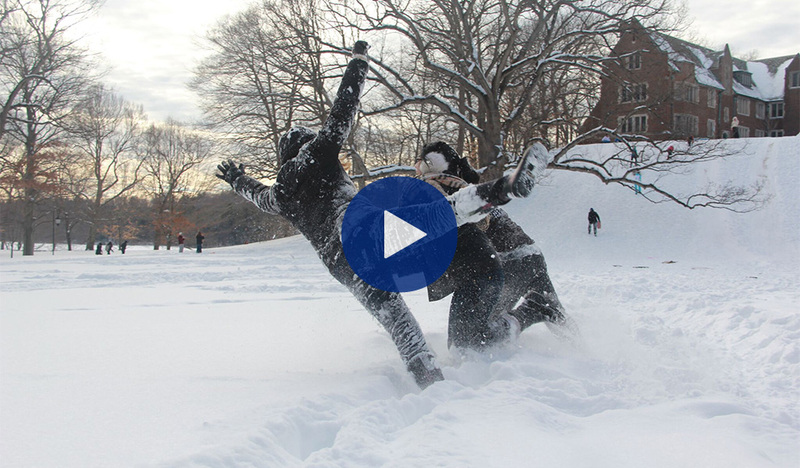 2015 brought record snowfall and cold to Wellesley. The snow melted away into a blossom-filmed spring, and then a jubilant commencement, an energetic welcome to the class of 2019, and a gala launch for the Campaign to Advance the Wellesley Effect followed. In the moments between, Wellesley studied, shared, researched, presented, laughed, played and learned. The variety, depth, and delight of these intellectual endeavors could blow you over like a nor'easter. As we welcome the season ahead, this year's seasonal video greeting takes a spin through campus and shares a small sample of our multitalented faculty at work—through the lens of a liberal arts winter, introducing just a few of the many people on campus who make Wellesley's intellectual community so vibrant. Through extras on the video website, you can learn more about the faculty members featured in the film and the music behind the greeting, which is excerpted from the Winter concerto from The Four Seasons by Antonio Vivaldi (1725), recorded by Lyrica Boston Chamber Orchestra, featuring Laura Bossert-King, senior music performance faculty in viola and violin, on violin. Whether the weather outside where you are is frightful or your climate is delightful, warmest wishes to the Wellesley community, and community at large, for a new year filled with happiness, joy, and peace!